One of my favorite restaurant desserts is the Olive Oil Cake at Union Restaurant in Pasadena. It’s not fancy or complicated, yet it tastes so good. It’s the dessert you think about once you leave the restaurant! What makes this dessert so special is the flour that they use. The restaurant takes pride in using locally-milled Sonora Wheat Flour from Grist and Toll. Here is my copycat version of the dessert I love so much. Enjoy! Preheat the oven to 350 degrees. Spray a 9-inch spring form pan with non-stick olive based spray. Add all the flour, baking powder and salt in a medium bowl and whisk. Set aside. In mixing bowl, add the sugar and orange zest and rub together with your fingers. Place the bowl with the sugar mixture on the mixer. Mix on low using the whisk attachment. Add the eggs and increase to medium for 30 seconds. Reduce to low, add the olive oil, milk, orange juice and vanilla. Mix until just blended. Remove from mixer. Using a large rubber spatula, fold in the flour mixture until just blended. Transfer batter to the greased spring form pan. Bake in the center of the oven for about 35-40 minutes, or until the top is golden brown and toothpick inserted comes out clean. Removed the ring. Arrange candied orange slices on the top of the cake in a beautiful pattern. To serve, cut a slice of cake. Remove the candied oranges and set aside. Place in a toaster oven until toasty. Serve with a drizzle of honey and ice cream. 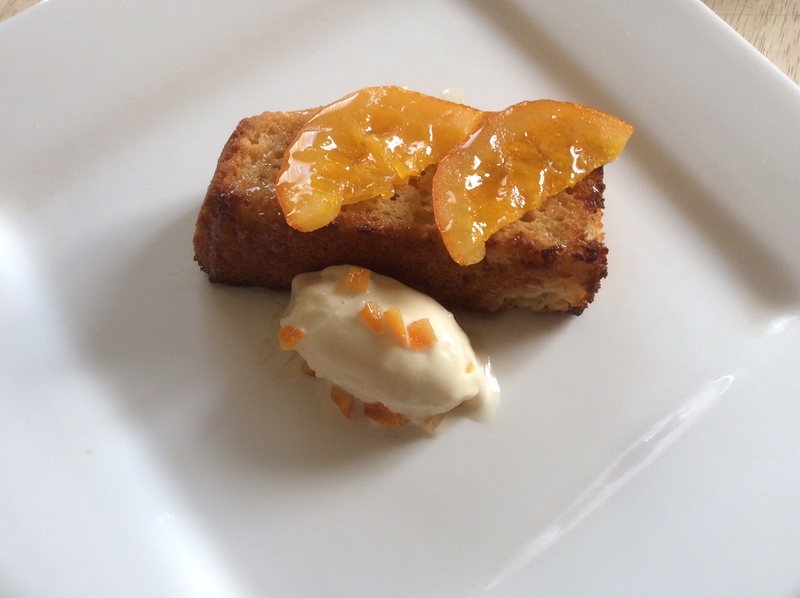 This entry was posted in Cakes and tagged Cake, Olive Oil, Olive Oil Cake, Olive oil cake with candied orange slices, Union Restaurant on September 26, 2015 by food4so.